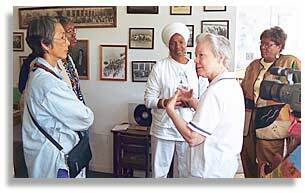 Nobuko Miyamoto, Robbie McCauley, Krishna Kaur, Sister Mary Beth and Jill Carson in conversation after a meeting at the Appalachian African American Culture Center in Pennington Gap, Virginia. Photo by Nic Paget-Clarke. The following interview with Nobuko Miyamoto is part of a series of interviews with some of the members of a group of 25 artists from around the U.S. and Canada who went to Kentucky and Virginia to participate in the initial stages of a multi-year, multi-site community art project sponsored by the American Festival Project. The American Festival Project is based in Whitesburg, Kentucky with Appalshop, a regional community arts center. Also see: Fred Campbell, Rodrigo Duarte Clark, Harrell Fletcher, Shannon Hummel, Stephanie Juno, Suzanne Lacy, John Malpede, Robbie McCauley. Nobuko Miyamoto: My name is Nobuko Miyamoto. I'm from Los Angeles. I'm a third generation Japanese American and I deal in the performing arts. For twenty-one years, I have run an arts organization called Great Leap which is a multi-disciplinary arts organization that creates work that opens boundaries between different communities, diverse communities. Most of this work is done in performance. We do different kinds of performances, several different kinds. One is a show that we call "A Slice of Rice, Frijoles and Greens" which is performed by three or four artists who have individual stories about their backgrounds. The show tours colleges and performing arts centers. We also we have a children's version in Los Angeles that tours the schools and reaches about 50,000 kids a year. We have several other shows. I have a one-person show called "A Grain of Sand". We have some music projects that we also tour. Great Leap started out as an Asian American performing arts company. My work started around 1969 when I became involved in the Asian American movement. I was already a dancer and into music, singing, but the work drastically changed when I became involved in the Asian American movement. The music that I did reflected the Asian American movement. I worked with two other singer songwriters. Chris Ijima and Charlie Chin and the three of us started doing music together, two guitars and three voices. We, somehow, in the '70s were the first group that was doing music that reflected the Asian American expereince. We made an album that became the first album of Asian American songs in this country. By some chance. Just being together. The work that we were doing in the communities. Moving around from New York, our base at that time. Then we moved around the country to all the Asian American communities, East to West coast and became like griots. We would see what was going in one community and take it to the next community. As a matter of fact, we are doing a reunion tour and we find that the same thing is true. We become the storytellers going from one university to another, and speaking of what is going on in other places. Recalling the history that we've lived through. Seeing and comparing what was going on then with what's going on now. How much has changed, and how much hasn't changed. From that work came Great Leap. I moved back to my home in Los Angeles. I put my roots there. I was teaching dance at Senshin Buddhist Temple which is a very active Japanese Buddhist temple. I began to create work in that temple based on custom, traditional music and dance performed by the community in the summertime at the Obon Festival. The reverend of that temple asked me if I would write some music for Obon based on the tradition of doing this circular dance that helped us remember our ancestors. That started me on another journey of working with community and creating with community. Some of these songs that I've written with them and the dances we created go on every summer in the communities. Not only Los Angeles, but other places in the country too. In Motion Magazine: How do the dances get created with the communities? Nobuko Miyamoto: I borrowed the vocabulary of the music and the dances and worked with some of the local dance teachers that remember all these dances. Every year, we teach it to the community, re-teach it to the community, before July when Obon usually happens. I'll create it or work with the teachers to create it, and then we get together with the eighteen teachers from the eighteen temples from around southern California. We learn it and they go to their temples and they teach it to all their people. During the month of June they all practice these dances. 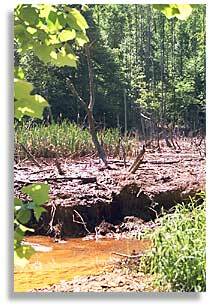 Polluted water pours from a mine and kills trees, plants and other life in its path near Pennington Gap, Virginia. Photo by Nic Paget-Clarke. We recorded them also. We record the music so they are able to do them at their own festivals. The festivals are done not on one day but on different days during the month so that each temple, if they want to, can visit the other temples. It's a way that people can stay in touch with the larger community of Japanese Buddhists. The Buddhist temples are the places where Japanese culture, was retained because when we came here of course most of us became very Americanized. The Japanese Buddhist temples were the place where the customs were retained. Of course it was changed, somewhat. They began to sing "Buddha loves me this I know, for the sutras tell me so" (laughs). Especially this temple, Senshin Temple. It is one temple that really wanted to try to hold on to these traditions, develop them, actually. Make them contemporary and relevant to young people so that traditions will go on and young people will continue to be involved in the temples. In Motion Magazine: Are there particular themes to the dances? Nobuko Miyamoto: I brought one of the albums here. It includes a song about a coal miner's dance. I thought that would be interesting to do if we had a chance to teach it to the community here. Some of them were fisherman's dances that came from Japan, though they are done more now in the smaller villages. In Tokyo, and the bigger places, it has become professionalized and people usually come to watch people dance. They don't actually participate themselves. But in the villages, in the smaller places, the whole community does it. At one time, it was one of the few occasions when people could take off from work. Then, and at New Years were the two times when the people, the farmers, could take off and enjoy themselves. The young people weren't chaperoned and they might disappear overnight and children might be born or people might be married a few months later. Proprieties were dropped at that time. The dance and the songs impart the essence of Buddhism as well. The idea is to just dance, to not worry about what other people think, or even what you think. Just be in the moment. Just dance. Obon is called "A Gathering of Joy". In Japan, just one or two circular dances woud last for two or three hours, or all evening. Here we do nine or ten dances. But at that time it was almost like a trance. People would go into this motion, repetition with the taiko drum, flute or lead singer, a chorus of people singing, and dancing. It's interesting that in Japan the dance is done clock-wise, but in America it's done counter-clockwise. We don't know why. That's one thing I have done with the community, the Japanese community in particular, besides creating pieces and songs that have told the stories of Japanese Americans and Asian Americans. A lot of my work, even my personal story work, is about trying to help to create more understanding between Asian and other communities. We weren't just in our struggles. Our history is very much related to other people's struggles. Especially now, I think that it's important because even though this place (Appalachia) is very isolated the same things happen in cities. Asians still socially stick to themselves. Latinos get socially stuck to themselves, et cetera. Part of this is because of feeling comfortable culturally, but part of it is because we are segregated. There are neighborhoods that Latinos live in, and that Blacks are relegated to, ghettoized in, et cetera. During the '60s and '70s there was a lot more crossover within communities because of the political work people we were doing. There was a lot of coalition work. But a lot of people, especially young people don't realize that that happened. There were relationships and influences that the Black movement had, and that the Asian American movement had. Latinos and Asians worked together. Et cetera. In New York, because there weren't too many Japanese Americans, we got a store-front as a drop-in center because Latinos, Puerto Ricans and Dominicans helped us get a store front in their community. We started having a big relationship with that community. We got involved in their struggles. In their squatter's movement, taking over old empty buildings and fixing them up for poor people and moving them in rent free. Things like that created relationships. And music...we would sing in Spanish to communicate and party. The same thing with the Black movement. The music was a bridge into other communities. It communicated our struggles with other people's struggles. This idea of being able to move from one community to another enriched communities and is something that I think, especially today, is really important. We are coming to that moment of 2015 when parity is going to be a reality. There's a lot of fear that people of color becoming an equal number is a threat to white people. There's a lack of understanding between communities, and I think the work of trying to make people understand each other stories, especially on a personal level is a very important step in showing the commonalties of our situations. When you hear these stories in Appalachia, you realize that there's not that much difference between us. Our stories are not so different. My grandparents as railroad workers and farmers and not being able to buy their own land, having laws against us marrying white people, and, of course, being sent to camp, these things happened to us and a lot of times white people don't know that. And we don't know the stories of these Appalachians. We don't know what they are going through, their history. I think it's really important especially today for us to do that kind of work.